There are you Backyardigans friends Pablo and Tyrone, they are having fun at the slide. If you want to see this again and again then you can make it your switchplate of you light switch. 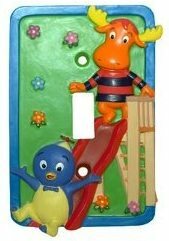 A kids room will be so much more fun when you have a Backyardigans switchplate to replace the boring one that came with the house. And it’s real easy to install just two screws and that is it. You have to come see the details of this Backyardigans Switchplate.